Every one of Schmid’s Fine truffles, classic confections and hand-dipped fruits are freshly coated in the highest-quality chocolate. We have selected what we consider to be the best cocoa from Belgium, Switzerland and the United States. Our superb imported cocoa is conched and tempered to ensure each melt-in-your mouth chocolate treat has a shiny hard shell to be filled with a variety of ganaches, creams, nougats, caramels and more. Love milk chocolate or know someone who does? Then the Schmid’s Milk Chocolate gift box is the assortment for you. This collection offers a great variety of tasty sensations and includes one of almost every milk chocolate we handcraft. This gourmet box will contain several luscious caramel variations, creams, fruit flavored creams, crunchy nuts, chews and more. The Schmid’s Dark Chocolate gift box is an extraordinary treat for anyone who enjoys the natural flavors of cocoa. This collection contains an assortment of luscious caramel variations, creams, fruit flavored creams, crunchy nuts and chews. This traditional collection is devoted to the experience of textures: chewy and crunchy. This gift box includes some of our best selling chocolates all in one memorable assortment. Includes Almond Toffee, Turtles, Caramels, Butterscotch, Molasses, Pecan Roll and Nut Clusters. This gift box offers an assortment of wonderfully intense creams, fruit flavored creams coated in either milk or dark chocolate. This melt-in-your mouth assortment includes chocolate cream, French butter, coffee, orange and lemon, and vanilla creams. Sugar-Free chocolate never tasted so sweet! The Schmid’s Sugar-Free gift box offers a collection of nearly every sugarless chocolate confection we craft. 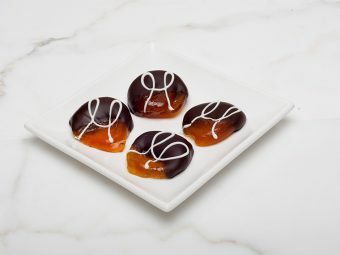 This assortment will include covered caramels, nut clusters, mild and dark coconut haystacks, cherry cordials and more. It is sugar-free delight, bite after delicious bite.